There is a lengthy history of Japanese creations influencing American toy culture, so it is no surprise that artists who grew up in the U.S. within the last 50 years may have been influenced by these imported designs. While those raised in the ’60s might fondly remember procuring Godzilla in his Aurora model kit form, it wasn’t strictly ‘strange beasts’ from films that captured the attention of an English speaking audience. Mattel‘s Shogun Warriors line debuted in the late ’70s, paving the way for ‘giant robot’ franchises like Transformers, Voltron: Defender of the Universe, Robotech, and Mighty Morphin Power Rangers, while those more inclined towards the cute were regaled by Hello Kitty and Pokémon paraphernalia. And it was the lasting effects of this cross-cultural impact that seemed to be the focus behind the Clutter Gallery‘s Monster Mash exhibition, a “Sofubi and Kaiju Showcase” that highlighted three non-Asian artists known for having been influenced by Japanese toy aesthetics and production methods: Bwana Spoons, Rampage Toys, and Secret Demon Services. Featuing strictly hand-painted versions of this trio’s creations, the exhibition space was teeming with anthropomorphic animals, strange beasts, imaginary monstrosities, and even mech-suited unicorns. 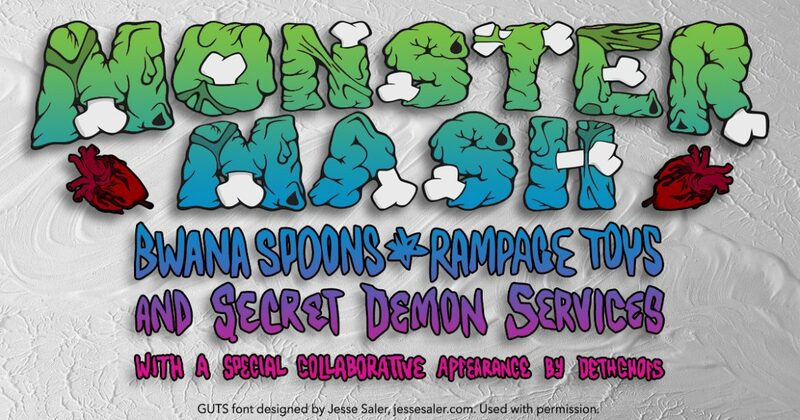 And while each artist strictly employed their own forms for Monster Mash, both Bwana Spoons and Rampage Toys embraced the show’s name by joining together parts from disparate works, unifying them into new, Frankensteined depictions. Also, making its debut at this outing, was the Magically Ugly Unicorn, a transparent cast resin rendition of Rampage Toys’ form housing a skeletal structure by Dethchops within it. Beware, gentle viewer, for here be dragons. The Monster Mash exhibition at Clutter Magazine Gallery had its opening reception on Saturday, September 9th from 6-9pm. All works in this exhibition will remain on display until October 6th, 2017 at the gallery’s physical location (163 Main Street, Beacon, NY 12508).